This is a coin issued by Transnistria. Knowing one might rightfully be wondering what is Transnistria about, we tried to depict on the site the issue as best as we could. Click the links below to clarify yourself. 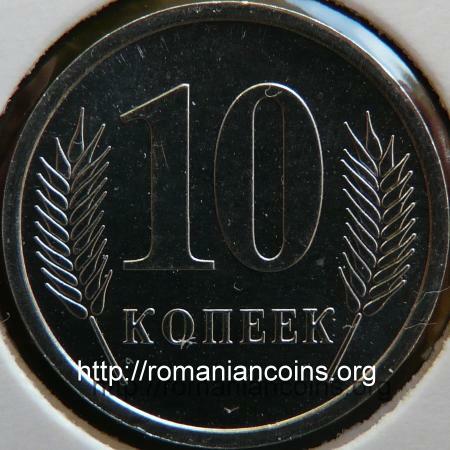 The coin belongs to a series comprising 5, 10, 25 and 50 kopecks. The 2005 series uses a new coat of arms. For further information confront the Modern and contemporary history section inside the Brief and Comprehensive History of Romanians and Romania page. 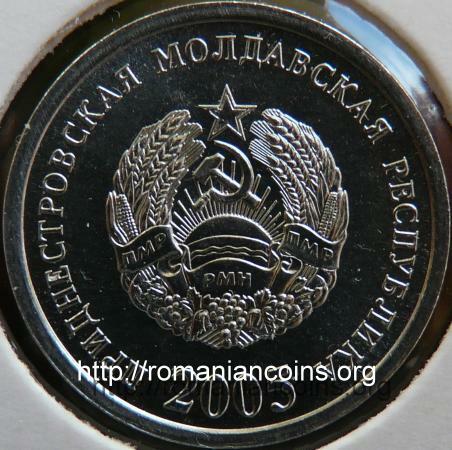 Why Transnistrian Coins on Romanian Coins? Because Transnistrian coins are held in their pockets and used as such by Romanian speaking Romanians on their native land.